I see that the USCA is starting a push to have part of the beef checkoff funds used to promote just domestic beef. This ties in really with the push USCA is making for Mandatory COOL. As long as the beef checkoff funds are used to promote beef, I'm not going to get my knickers in a knot over whether it is domestic beef or not. Simple supply and demand. 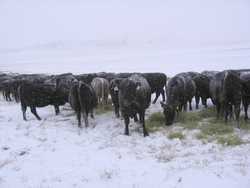 If demand is up for beef, whether it is us beef, organic beef, natural beef, or the usual corn fed beef, I will benefit. Real simple. Our neighbors buy thousands of steers from Mexico, put huge gains on them all summer on our mountain grass, then sell them as American beef. I haven't asked them how they feel about all this COOL business. Yea I agree, that is not American beef. But COOL is not going to stop them from bringing Mexican cattle in. It will still be too profitable not to. I'm sure they will also find or create a loophole in COOL so they can be counted as US Beef. In fact under the proposal before congress they could be labeled as a product of USA and Mexico. With the USA first and in bold consumers will get fooled. A little snow storm made things miserable and wet around here. I guess the moisture is good so I shouldn't complain. Why does it always happen when I start calving though? Taken 2/9/2006.